After creating a virtual machine, the final step is installing a guest operating system. Andrew Kutz shows you how in the final installment of the VMware on Linux series. In the last article, we learned how to create a virtual machine. Now let's turn our attention to getting an OS onto the VM. This is the easiest step of all. For the purposes of this article, the guest operating system to be installed will be Windows 2003 Server Standard. The first step to installing the guest operating system is to insert the Windows 2003 Server Standard CD into the server's CD-ROM drive. If this is an OS that will be installed frequently in a VM, it may be worthwhile to create an ISO image of the install CD -- you can do this with the command "dd". Using an ISO image with VMware Server is very easy. The new VM that was just created should be selected in the VMware Server Console. If it is not, select it now. Click the "VM" menu item and then click on "Settings." A new window titled "Virtual Machine Settings" will appear with a menu on the left listing the VM's devices. Select the "CD-ROM (IDE 1:0)" device. There is an option on the right that is labeled "Use ISO image." Selecting this option and then browsing for the ISO image is all that is required to use the ISO image. The VM will treat it as a CD that has been inserted into the CD-ROM drive. Once the install CD has been inserted or the ISO image mounted, it is time to power on the VM. The very first time a VM is powered on, the CD-ROM is the only device in the boot order, so any bootable CD or ISO image present to the VM will be booted. However, all subsequent times the VM is powered, the CD-ROM is not in the boot order (by default) and manual intervention is required to boot from a CD or ISO image. Just a little note that may prevent some frustration in the future. After the CD has booted, install Windows as per normal. After Windows has been installed, VMware Tools needs to be installed. VMware Tools consists of special drivers that know how to interact with VMware Server. Specifically, VMware Tools will allow the VM to have a better screen resolution and color depth, a faster (Gigabit) network connection and intelligent memory management. VMware Tools provides other functionality as well, and to read all about it, be sure to check out the section on VMware Tools that starts on page 39 in the VMware Virtual Machine Guide for VMware Server. To install VMware Tools, click on the menu item "VM" and then click on "Install VMware Tools." A window similar to the following will appear. Click "Install" so that the VMware Tools ISO image is mounted as a CD inside the VM. The rest of the installation takes place inside the VM. The installation is fairly straightforward. Select the "Complete" installation option when prompted. At some point the following popup will probably appear. 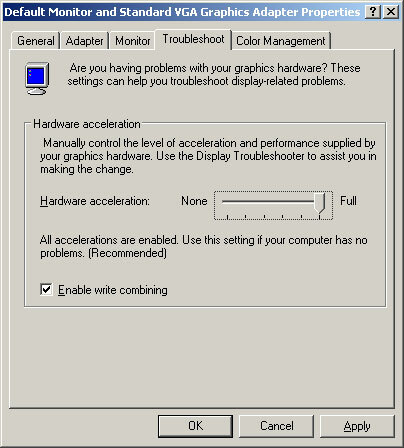 Now that the VMware Tools SVGA video driver has been installed, Windows wants to enabled hardware acceleration. Click the "Yes" button. The display properties window will appear. Click on the tab labeled "Troubleshoot" and drag the "Hardware acceleration" slider all the way to the size that says "Full." Click "OK." Then click on the "Finish" button on the VMware Tools installation window. Reboot the machine to complete the VMware Tools installation. VMware has a very nice guide for installing guest operating systems available at VMware's Website. I have mentioned this throughout the guide, but it is important enough to mention again. If you update your server's Kernel, it may be necessary for you to reconfigure VMware Server. You do this by executing the command /usr/bin/vmware-config.pl. If you do not do this, the VMware Server modules may not load into the running kernel and your VMs will lose things like network capabilities and advanced memory management. Please keep this in mind. It was the goal of this series to provide a guide for system administrators in creating a secure deployment of VMware Server on Linux. If you have any questions, send them to my SearchServerVirtualization.com Ask the Expert mailbox at editor@searchservervirtualization.com.